Which is worse: stealing a loaf of bread, or allowing a man to starve? Earlier reports flagged suspect as graffiti artist with an anti-​authority/​anarchist leanings. Suspected of organizing radical protests, occupying public spaces and erecting tent cities, and other public disturbances. Uses social media and hacktivism to harass political figures, business leaders, and peace officers. Targets individuals and organizations of financial success or prominence. Reports of recent radicalization from undercover officers. Acquisition of well-known precursors suggest attempts at manufacturing explosive devices. Anarky is wanted on charges of trespassing, destruction of public property, destruction of government property, and unregistered demonstrations. Has been added to domestic terrorist watch. Arkham Origins Anarky wears a plain white mask that makes him look like a member of Anonymous - which makes sense, since, in the original comics, Anarky was basically just an attempt to create a "superhero-ized" version of Alan Moore's V (for Vendetta). It wasn't just the philosophy, either - they even dressed alike! The modern take on Anarky drops the flat-brimmed hat and the giant cape for a more realistic costume. He's wearing a heavy winter jacket and cargo pants, both done in a deep brick red. 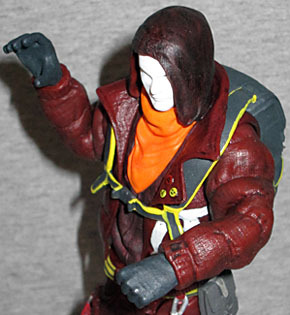 A red hood covers his bald head, and there's a bright orange scarf around his neck. He has a heavy pair of workboots, and mis-matched kneepads. Like many young activists, he's got a big backpack, sculpted with realistic closures, a few after-market studs (the kind you could buy at any Hot Topic or head shop) and several safety pins. He's a rebel! 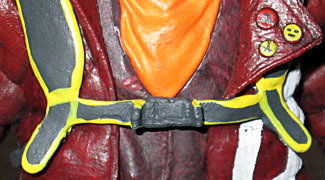 The arms of the coat (as well as the hood) are made from thin, flexible PVC, rather than stiff ABS. That allows the elbows to move, without needing to sculpt big joints into the coat. Personally, I don't see a problem with real joints, but this works fine. You can feel the toy's "real" arms under there: they're just thin sticks with a big hinge in the middle, rather than anything anatomical. The head is a balljoint, which is why the hood is flexy, too. He's also got swivel wrists, swivel/hinge shoulders, swivel waist, H-hips, double-hinged knees, and swivel boots. He's got no ankles, but big deal. A waist and double-hinged knees? That's astounding! Less impressive is the paint. 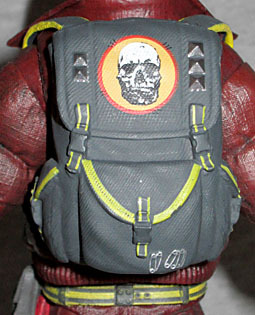 The colors are nice, but the yellow outlines on his backpack straps are very sloppy. 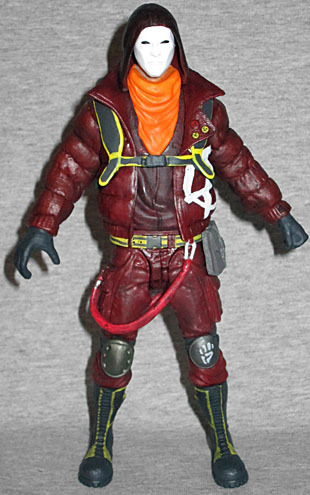 Conversely, the yellow paint on his boots and backpack is rather thin, but that beats the alternative. There's an icon of a fist on one kneepad, and a giant white Ⓐ on his side. There are three pins on his lapel, and his mask is glossy white. Anarky comes with only one accessory, but it's a neat one: a Molotov cocktail. Molotov cocktails are named after Vyacheslav Molotov, foreign affairs minister for the Soviet Union from 1939 to 1949. During Russia's invasion of Finland, Molotov went on Soviet state radio to explain that bombing runs over Finland were actually performing food drops. The Finns began to refer to the bombs as "Molotov bread baskets," and when they started fighting back against Soviet armored cavalry, they sarcastically offered Molotov Cocktails as "a drink to go with the food." That's awesome. And so is this accessory. The bottle is clear plastic, two pieces sealed around a painted wick and a bit of translucent "liquid" in the bottom, with a huge plume of fire coming out the top. It looks incredible, and Anarky's right hand is shaped to hold it perfectly. 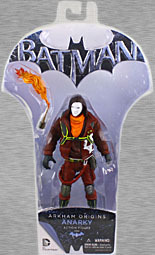 The Arkham Origins action figures have packaging that does something I've never seen before: easy-open clamshells! Holy crap, how has that never happened before?! There's a hole in the back where you can slip your finger inside, then the edges are perforated so the back panel can be removed easily. Seriously, we cannot praise this enough. The shape of the packaging is... unusual, but not especially appealing: it has a wide, bat-shaped flare at the top, and a narrow body; so it shows off the figure decently, but the tear-away flap on the back is the real star, here. The gauntlet has been thrown down, other companies - it's time for you to blatantly steal this idea. Anarky is a rather unique Batman villain - in that unlike most of them, he's actually right. While Batman's philosophy is "all crime must be punished," Anarky's is "all wrongs must be righted," and that brings us back around to the question asked at the beginning of this review - Batman would beat up the guy stealing bread, while Anarky would tear down the systems that left him hungry in the first place. At the end of Anarky's first appearance, Batman even admitted that his cause was just. Anarky's videogame incarnation is more down-to-earth than the way he looked in the comics, but this is a great toy of it.